Hey, beautiful people! With Michigan winter fully in gear, I put my wash n' go challenge on hold and put my hair into hiding, typically in braids. 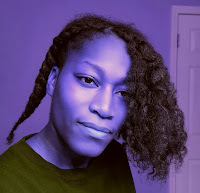 I tried twists, and they just don't give my hair the same definition. Also, I have to be careful because my is also fine, so it break easily with too much tension. During the week, I typically keep my hair in two crown braids, with the last inch of hair at the nape of my neck cornrowed in a separate braid. I intend to test out a number of the twist creams in my hair to determine which ones leave my hair with the most moisture, sheen and definition.